UPDATE - The A15 in Lincolnshire remains closed this afternoon following a multiple vehicle collision near Aslackby this morning. At just after 9am today (Thursday) police were alerted to the collision on the A15 between Aslackby and Folkingham. 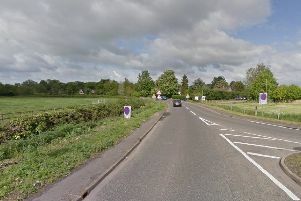 Lincolnshire Police say the road is closed in both directions between the A52 and the Temple Road, Aslackby, junction, because of a collision involving a total of seven vehicles, including a motorbike. A police spokesman said nobody was seriously injured as a result, but several people have been taken by ambulance to hospital for treatment for minor injuries. The Highways Agency are also in attendance after oil was spilt along a 50-80 metre stretch of road. Enquiries are underway to establish the exact circumstances involved and the road will remain closed while recovery work is carried out. Anyone who witnessed the collision is asked to contact the Lincolnshire Police Collision Witness Hotline on 01522 558855 or the non-emergency number 101 quoting incident 95 of 05/11/2015.